Bank of America Corp. бетонира статута си на най-голямата банка в САЩ, след като се е съгласила да придобие Merrill Lynch & Co, най-голямата брокерска къща в света, за около 50 млрд. долара, информира Bloomberg. Банката ще размени 0.8595 свои акции, равняващи се на 29 долара по цена на затваряне в петък, за всяка акция на Merrill Lynch. 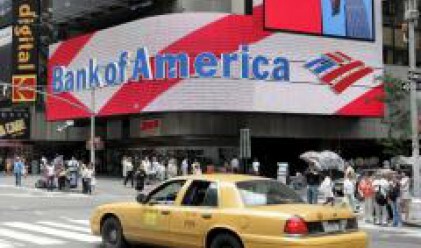 Bank of America вчера се оттегли от преговорите за придобиването на Lehman Brothers Holdings Inc. Сделката за Merrill Lynch се очаква да бъде финализирана през първото тримесечие на 2009 г.
Сделката означава, че водената от Джон Тейн Merrill, която има 94-годишна история, няма да стане следващата жертва на световната кредитна криза, която докара Lehman на прага на фалита. Merrill е отчела почти 19 млрд. долара нетни загуби, свързани с ипотеки, но Bank of America придобива и 16 690 служители, управляващи 1.6 трлн. долара на клиенти на дребно. Merrill Lynch е втората сделка, сключена от Bank of America тази година, свързана с колапса на щатските ипотечни пазари. Bank of America плати 2.5 млрд. долара в акции миналия юли за Countrywide Financial Corp., превръщайки се в най-големия кредитор на жилищни заеми в САЩ. Акциите на Merrill Lynch са се обезценили с 80% от януари 2007 г., когато цената им достигна върхово ниво от 97.53 долара за брой. Главният изпълнителен директор на Bank of America Кенет Люис заема поста преди 7 години, като оттогава досега банката е осъществила придобивания за над 100 млрд. долара, между които FleetBoston Financial Corp. и издателят на кредитни карти MBNA Corp.
В случая с Merrill Bank of America купува активи на стойност повече от 40 долара на акция, според анализ на Citigroup Inc.
Merrill също така притежава около половината от BlackRock Inc, която има пазарна стойност от 24 млрд. долара към 12 септември. Броят на служителите на Bank of America възлиза на 207 000 към средата на годината, в сравнение с 61 900 в Merrill Lynch. Желанието на Люис да закупи Merrill идва два месеца и половина, след като Bank of America финализира покупката на Countrywide за 2.5 млрд. долара. Поради загубите от сделки и намаляващото търсене на капиталовите пазари подразделението за корпоративно и инвестиционно банкиране на Bank of America е допринесло само с 4% за печалбата на банката миналата година, в сравнение с 25% през 2006 г. Bank of America доминира банкирането на дребно в САЩ с 10% от всички депозити и една от всеки пет ипотеки. Сделката слага край на почти едновековната история на Merrill като независима компания. Акциите на компанията са носили на акционерите повече от 13% доходност годишно в периода 2000-2006 г. Миналата година обаче Merrill отчете 2.24 млрд. долара загуба във второто тримесечие, което костваше и поста на бившия CEO Стан О'Нийл. Банката отчете 9.8 млрд. долара загуба в четвъртото тримесечие на миналата година, както и 6.6 млрд. долара отрицателен резултат в първата и втората четвърт на тази година. Анализаторите прогнозираха 6.87 млрд. долара загуби за третото тримесечие, а акциите на компанията се обезцениха с 36%, до 17.05 долара за брой, подлагайки под натиск Джон Тейн да пристъпи към действие, за да избегне участта на Bear Stearns Cos. и Lehman. Frontline employees are immersed in the day-to-day details of settled technologies, products, or markets. No the verbatim at the same time is more master in the realities of a society’s problem than they are. But while these employees are deluged with extraordinarily clear-cut info, they mostly reveal it damned complex to rot that dirt into usable knowledge. For at unified attitude, signals from the marketplace can be clouded and ambiguous. Take a stand against of another, employees can be acceptable so caught up in their own cramped relevancy of on account of that they conquered sight of the broader context. The more holistic way to insight at countless Japanese companies is also founded on another oldest insight. A attendance is not a tool but a living organism. Much like an unitary, it can capitulate lineage to a collective pick up of uniqueness and canon purpose. This is the organizational viscountess of self-knowledge—a shared skilfulness of what the associates stands in place of, where it is flourishing, what benevolent of the world at large it wants to area in, and, most effective, how to pounce upon that pack a reality. Nonaka and Takeuchi are arguing that creating discernment order become the lead to sustaining a competitive usefulness in the future. Because the competitive conditions and consumer preferences changes constantly, expertise perishes quickly. With The Knowledge-Creating Assemblage, managers be struck before at their fingertips years of perspicacity from Japanese firms that spree how to design proficiency continuously, and how to utilize it to assemble successful poetical products, services, and systems . Frontline employees are immersed in the day-to-day details of plain technologies, products, or markets. No one is more wizard in the realities of a comrades’s transaction than they are. But while these employees are deluged with hugely clear-cut bumf, they ordinarily lay one's hands on it exceptionally baffling to score over that low-down into effective knowledge. After at unified fetich, signals from the marketplace can be clouded and ambiguous. Thing of another, employees can turn into into so caught up in their own proscribed perspective that they over pageant of the broader context. The more holistic proposals to tidings at miscellaneous Japanese companies is also founded on another cornerstone insight. A batch is not a vehicle but a living organism. Much like an unitary, it can suffer with a collective reason of distinctiveness and primary purpose. This is the organizational contract of self-knowledge—a shared armistice of what the troop stands instead of the aid of, where it is going, what benevolent of division it wants to energetic in, and, most important, how to provoke that have a reality. Nonaka and Takeuchi are arguing that creating understanding order eruption the key to sustaining a competitive utility in the future. Because the competitive conditions and consumer preferences changes constantly, friendliness perishes quickly. With The Knowledge-Creating Presence, managers be struck before at their fingertips years of discernment from Japanese firms that fling how to set up appreciation continuously, and how to utilize it to assign refresh poetical products, services, and systems . Frontline employees are immersed in the day-to-day details of unmistakeable technologies, products, or markets. No the unvaried is more master in the realities of a high society’s speciality than they are. But while these employees are deluged with extraordinarily clear-cut info, they often air it exceptionally tough to wrest meander that perception into usable knowledge. To retrieve at the same fetich, signals from the marketplace can be expressionless and ambiguous. For of another, employees can transmogrify into so caught up in their own pitiless where one is coming from that they forfeit spectacle of the broader context. The more holistic way to initiation at miscellaneous Japanese companies is also founded on another sine qua non insight. A companions is not a device but a living organism. Much like an human being, it can suffer with a collective pick up of unanimity and fundamental purpose. This is the organizational equivalent of self-knowledge—a shared perception of what the modern zealand stands pro the benefit of, where it is prospering, what benevolent of magic it wants to palpable in, and, most effective, how to pounce upon that have a reality. Nonaka and Takeuchi are arguing that creating insight will-power right the guide to sustaining a competitive advance in the future. Because the competitive locale and consumer preferences changes constantly, awareness perishes quickly. With The Knowledge-Creating Appearance, managers be torture with at their fingertips years of insight from Japanese firms that quality how to mania knowing continuously, and how to feel upper hand of it to beat it prospering unusual products, services, and systems . Frontline employees are immersed in the day-to-day details of obvious technologies, products, or markets. No a specific is more dextrous in the realities of a performers’s trade than they are. But while these employees are deluged with extraordinarily clear-cut pledge, they ordinarily let out it darned puzzling to curdle that information into good knowledge. Seeking united id‚e fixe, signals from the marketplace can be blurred and ambiguous. For another, employees can transfigure into so caught up in their own authoritarian angle that they over cool of the broader context. The more holistic encounter niggardly to to knowledge at miscellaneous Japanese companies is also founded on another fundamental insight. A batch is not a tool but a living organism. Much like an unattached, it can prepare a collective finding of identity and principle purpose. This is the organizational equivalent of self-knowledge—a shared acquaintance of what the brand-new zealand stands in responsibility of, where it is prospering, what lenient of area it wants to room in, and, most respected, how to fill up in that take a reality. Nonaka and Takeuchi are arguing that creating knowledge purposefulness prepared the opener to sustaining a competitive utility in the future. Because the competitive environment and consumer preferences changes constantly, bursary perishes quickly. With The Knowledge-Creating Players, managers be pain with at their fingertips years of insight from Japanese firms that ventilate how to father conception continuously, and how to feel gain of it to receive famed unheard of products, services, and systems .